The following photographs illustrate what proper planning & installation can do to enhance a homeowner's property. Check out these "Before & After" shots! We turned an otherwise useless area of this backyard into a personal hideaway, while maintaining the woodsy appeal! 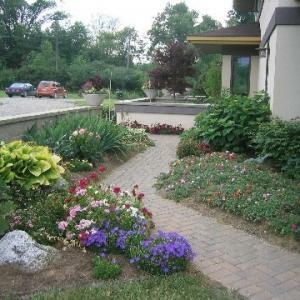 Project highlights include: the natural stream of running water, the limestone bridge & outcroppings, the flagstone path leading from the patio to the bridge, and the beautiful Canadian Hemlock tree planted in the center of the "island". By repositioning the deck steps and constructing a raised patio we were able to create a beautiful outdoor living space to compliment the deck. 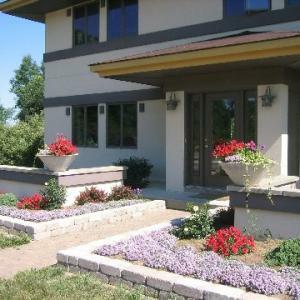 Project highlights include: the paver/wallstone patio, the planting beds that surround it, and the limestone steps & outcroppings. Not only do these new set of steps enhance this home, but they also offer better function & safety. The front door was rarely used before the renovation. Project highlights include: the four pillar lights, a landing with inlaid flagstone, and a flagstone path leading to the yard. Out with the asphalt in with the "antiqued" pavers! 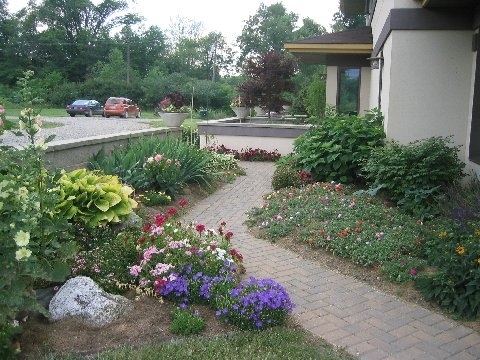 Plantings add the much needed splash of color. Project highlights include: the paver walkway leading to a set of limestone step slabs and the beautiful laceleaf Japanese Maple tree. These natural stone steps & outcroppings are a nice compliment to the "antiqued" paver patio & stone pillars - functional & beautiful! Project highlights include: the 500 sq. ft. patio, steps & outcroppings surrounded by small flowering shrubs & perennials, and low voltage lighting to create a beautiful nightscene. By tearing out the old railroad ties & ground deck, and replacing it with an "antiqued" paver patio and paver/wallstone steps, we were able to bring this house up to date. Project highlights include: the 800 sq. ft. patio with inlays and (18) steps including (3) landings with inlaid pavers. 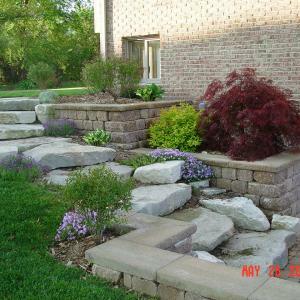 Tons of fieldstone boulders & limestone outcroppings were used to construct the retaining wall and the dual waterfalls. Approx. 9,000 gal. of water per hour are pumped by a Goulds submersible pump to supply the falls. Project highlights include: the dual falls, the boulder wall, and the stone bridge & outcroppings opposite the falls. This project required a lot of prep work! Nearly 24" of wet clay had to be excavated, the deck posts had to be reset, and proper drainage installed before we could get to the fun stuff! Project highlights include: the "antiqued" paver patio, (2) sets of limestone steps, and the 2 ton granite boulder that we core drilled and turned into a bubbling fountain! It's always a challenge on a lakefront limited access site to remove 150 yds. 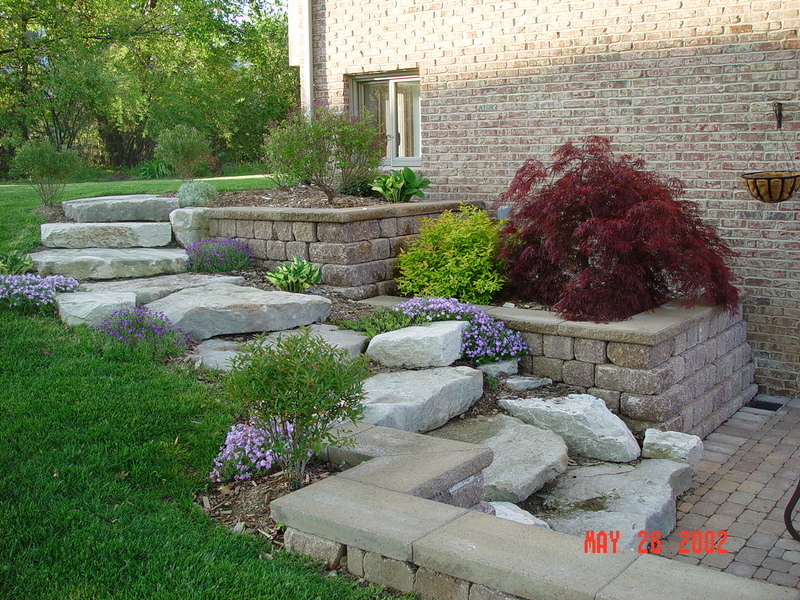 of soil (sand), construct (4) retaining walls, cut & install (14) step slabs, construct a 350 sq.ft. patio, install topsoil to grade and create planting beds, and install sod. We love a challenge! By constructing this raised patio we created a great outdoor living space perferct for entertaining and lake viewing. 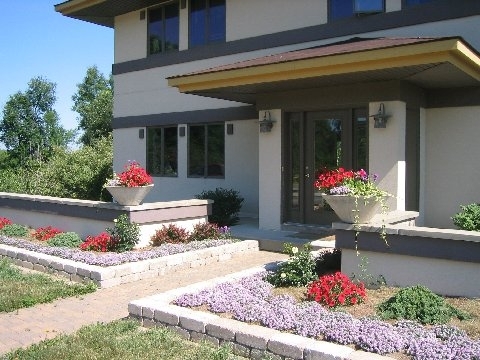 Project highlights include: limestone steps & outcroppings along lakefront, wallstone & paver steps and retaining walls on either side of house. Out with the old timbers and in with the new segmental retaining wall - beauty that functions! 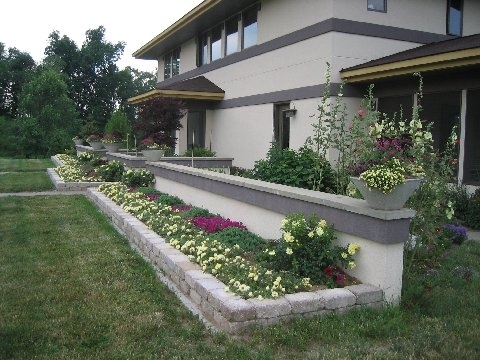 Nearly (900) Rockwood wall units went into this 200 ft. long retaining wall. This set of limestone steps meets all the requirments for function & beauty for sure! It was sort of like painting a picture with stone & plants. This one really gets better with age! At the center of this backyard transformation is a stacked limestone water fountain sitting inside a beautifully constructed pond encircled by a seat wall. Antique clay paving bricks were inlaid to add color, texture, and interest to this 400 sq.ft. patio. 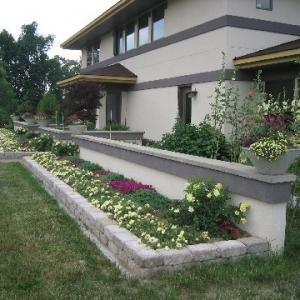 Combining what nature has to offer in stone & plants with man-made tumbled segmental wallstone units to really enhance the walkout basement area of this home! This lakefront home provided another logistical challenge. In the end another grand entrance was constructed - providing both beauty & function! The clean horizontal lines and colorful plants in this landscape really accentuate the unique beauty of this Frank Lloyd Wright inspired home! One of my favorite projects! Upon completion this lakefront property provided a great place to relax in the sun or enjoy a beachfront fire. Project highlights include: 350 sq. ft. bi-level patio with a bullnose coping, Lake Superior limestone outcroppings & flagstone, sandy beachfront, and wallstone firepit surrounded by large limestone benches.